Isco has been linked with a move away from Real Madrid but boss Santiago Solari declined to entertain suggestions of a rift with the player. Santiago Solari refused to discuss his relationship with Real Madrid playmaker Isco amid reports of a rift between the two. Isco is yet to start a game since Solari succeeded Julen Lopetegui as head coach in October and the Spain international was left out of the matchday squad for Tuesday's 2-0 Champions League win at Roma. The situation has resulted in a host of clubs being linked with his services, including Chelsea, Arsenal, AC Milan and even Barcelona alongside his perpetually touted move to Manchester City. Solari insisted his midweek decision to drop Isco was tactical and declined to shed any further light on the issue ahead of Saturday's match against Valencia. "Honestly, I think there's not really anything to talk about here," he said. "I spoke the other day. These are things that happen, they are decisions that have to be made. That's it. "I can't be speculating all the time here with you guys. "There are 24 professionals, they are all working hard and we have to take decisions. There's nothing more to say." Solari added: "I do whatever I consider is best for every single player. Every single one is important. We are all Real Madrid." One midfielder to have caught Solari's eye is Marcos Llorente, who was named in the starting XI for a first Champions League appearance of the campaign against Roma. "He put in a really great performance," he said. "He hadn't been playing, he didn't have competitive rhythm and it speaks highly of him to come into a game like that and play as he did. "It shows how he's working. He's a great professional and hopefully he stays on that route. It will guarantee a long career." 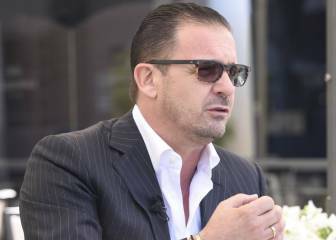 Mijatovic: "I'm not convinced by this Madrid side"